Exceeding 350g of alcohol every week could shed four to five years off their life. Drinkers who consume more alcohol than UK guidelines suggest could be cutting years off their lives, according to new research. Nearly 600,000 people were analysed, with results showing those drinking more than 100g of alcohol every week - around five 175ml glasses of wine or pints of beer - are at an increased risk of early death. Drinking more alcohol was also linked with a higher chance of strokes, heart failure, or fatal aneurysms, according to the study. 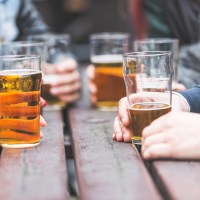 The findings support recently lowered guidelines in the UK, which recommend that both men and women should not drink more than 14 units or 112g of pure alcohol in a week. This equates to around six pints of 4% strength beer or six 175ml glasses of 13% wine. Dr Angela Wood of the University of Cambridge, who led the study, said: "The key message of this research for public health is that, if you already drink alcohol, drinking less may help you live longer and lower your risk of several cardiovascular conditions." A 40-year-old regularly drinking between 200g and 350g of alcohol per week - about 10 to 18 glasses of wine or pints of beer - had a lower life expectancy of around one to two years, researchers found, having studied just under 600,000 people from 19 different countries, none of which had a known history of cardiovascular disease. Those exceeding 350g of alcohol every week could shed four to five years off their life. Experts said of that study, that "on balance" there are no health benefits from drinking. Dr Wood said: "Alcohol consumption is associated with a slightly lower risk of non-fatal heart attacks but this must be balanced against the higher risk associated with other serious - and potentially fatal - cardiovascular diseases." The authors of the study said recommended alcohol limits should be lowered to around 100g or 12.5 units per week in many countries. UK guidelines were changed in 2016 to 14 units every week for men and women, lower than the limits in Italy, Portugal and Spain. The upper recommended limit for men in the US is almost 25 units of alcohol per week. Commenting on the findings, Professor Tim Chico, professor of cardiovascular medicine at the University of Sheffield, said: "The study makes clear that on balance there are no health benefits from drinking alcohol, which is usually the case when things sound too good to be true. "Although non-fatal heart attacks are less likely in people who drink, this benefit is swamped by the increased risk of other forms of heart disease including fatal heart attacks and strokes." Travelling with a pre-existing medical condition? Get the insurance you need before jetting off.